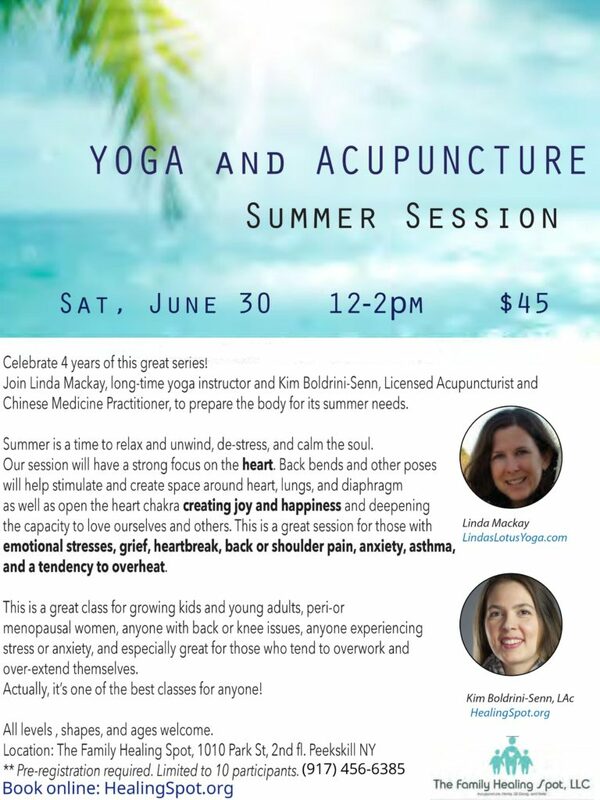 Join long-time yoga instructor, Linda MacKay and Chinese Medicine / Qi Gong/Reiki specialist, Kim Boldrini-Senn for this year’s summer Yoga Acupuncture class. We are celebrating four years of bringing this sold-out series to the public, with the East coast edition happening Saturday June 30th 12-2pm in the Peekskill Clinic. $45. Do you ever feel like your summer is already booked and overwhelming before it even starts? Summer is actually the time to relax and unwind, de-stress, and calm the soul. Our session will have a strong focus on the heart. Back bends and other poses will help stimulate and create space around heart, lungs, and diaphragm as well as open the heart chakra creating joy and happiness and deepening the capacity to love ourselves and others. This is a great session for those with emotional stresses, grief, heartbreak, back or shoulder pain, anxiety, asthma, and a tendency to overheat.